Some wines cling to their fame and clearly belong to the Premier League of wine regions. They remain sought after and a byword for style. Bordeaux and Burgundy would both fall into that category. However France is stuffed full of delights from other places that most of us would enjoy very much if we could just stop focussing on the great wine regions for a bit. Bergerac’s fame mainly rests with its popularity as a tourist destination, many British people visit the area, have houses there or drive through on their way to the south and a great many of them must enjoy the local wines while they are there, but seemingly few of them remember the wines with anything other than a passing affection. Which is a great shame as there are very good wines to be had from this part of the world. I suppose one problem might be that this is overwhelmingly inexpensive wine country. When you stay there you can get bottles of wine for around €1 or €2, which while unexciting are perfectly serviceable – I know many people who go there buy wine from the local co-ops in bulk bag-in-box containers. However enjoyable or adequate as these might be, they might not get lodged in your memory as a wines worth seeking out. Whereas day trips to nearby St Emilion might well reinforce your mental picture of Bordeaux as a fine and expensive wine region, so the bottles to be remembered and taken home might well be from Bordeaux even though your holiday was in Bergerac or the wider Dordogne region. Bergerac is in the Dordogne, which is part of Aquitane and is really part of the south west or Sud-Ouest, but from a political point of view the wines of Bergerac are no longer considered wine of the Sud-Ouest, but a region alone. Map of Southwest France including the A.C.s of Bergerac – click for a larger view – non watermarked PDF versions are available by agreement. This whole area is achingly beautiful and full of gorgeously scenic little towns and villages full of lovely local restaurants serving the most marvellous food – the region is famous for the black Périgord truffles and foie gras. Bergerac is an agricultural area whose population has been in decline since 1850, so the landscape feels empty and rural and the towns small and quiet – a world away from the bustle of Bordeaux. Bergerac neighbours the Bordeaux region with the eastern boundary of Bordeaux’s Libournais district – St Emilion, Pomerol, Côtes de Castillon etc. – giving way to the Côte de Bergerac vineyards. As you might expect the climate is similar to Bordeaux, as are the clay and gravel soils and they even use the same grape varieties to produce wines that are not dissimilar to a wide spread of Bordeaux styles. The reds are overwhelmingly made from Merlot and Cabernet Sauvignon, although Malbec and Cabernet Franc are used, while Fer/ Fer Servadou and the local Mérille also get a look in at the lower end of the price spectrum. The white wines are also made from the Bordeaux classics with the better examples being Sauvignon Blanc and Sémillon blends, although again Muscadelle, Ondenc, Chenin Blanc and Ugni Blanc are also permitted and find their way into much of the lower priced wines. Where Bergerac differs from Bordeaux is that the production is much more mixed with red, rosé, dry white, slightly sweet and full on dessert wines produced across the region, however there are sub-divisions to emphasise the local specialities and this has resulted in many different appellations. Bergerac – Bergerac Sec, Bergerac Rosé, Bergerac Rouge – this is the basic catch all appellation that covers the whole region. Côtes de Bergerac – Côtes de Bergerac Rouge, there are no slopes here, so this A.C. covers the same area as Bergerac, but the wines have a degree more alcohol, which makes this the appellation used for the finer reds of Bergerac. Côtes de Bereac Blanc can be either Sec, Demi-Sec or Moelleux / semi-sweet. Monbazillac – a great dessert wine appellation for wines made from botrytis affected Sauvignon Blanc, Sémillon and Muscadelle grapes. These wines are perfect with the local foie-gras, blue cheese or fruit based puddings. Montravel – this westernmost outpost of Bergerac surrounds the commune of Lamothe-Montravel and makes both reds and dry whites of high quality, sadly not often seen in the UK. The reds must include at least 50% Merlot and are very similar to the nearby Côtes de Castilon wines. Côtes de Montravel – white wines in a rich semi-sweet style, at between 8 and 54 grams per litre of residual sugar they are not really dessert wines and would normally be labelled as Moelleux. Pécharmant – a red only appellation widely considered to be the finest in Bergerac. 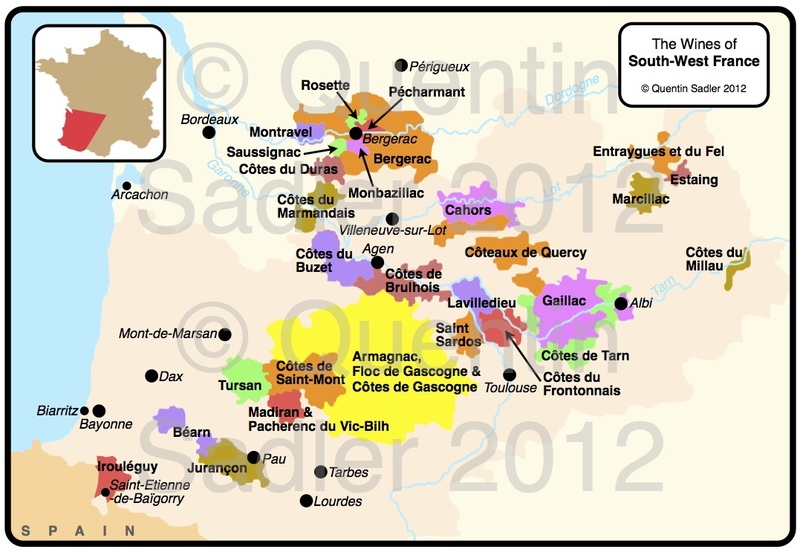 Saussignac – another dessert wine appellation, from Sémillon, Sauvignon, Muscadelle, Ondec and Chenin Blanc this time. The wines must have at least 18 grams of residual sugar, the best examples are much sweeter and very like the best Monbazillacs. I have recently been fortunate enough to taste a few Bergerac wines that are available in the UK. A very nice dry white wine, with a slightly fat style from the Sémillon, but underscored by crispish acidity. The aromas are bright with a touch of herbs and a honeysuckle floral quality. Green fruit and a little zing make this very attractive, if undemanding. The nose is gently aromatic with herbs, grassy and goosebery with a soft acidity. Very enjoyable and attractive stuff – 86/100 points. £8.99 a bottle from Sainsburys – sometimes 2 for £12. I have known this estate for many years and it consistently makes excellent quality wines with more finesse than you would expect. This is aged on the lees which adds a touch of richness that balances all that freshness and zing and that subtle touch of riper, almost tropical fruit. An outstanding example – 89/100 points. Around £9.50 a bottle from The Wine Reserve & The Oxford Wine Company. This 50/50 Cabernet and Merlot blend has an enticingly bright medium deep strawberry colour with an elegantly restrained nose of strawberry and rose hip. Soft, rounded mouthfeel with ripe fruit and soft acidity keeping it fresh enough. Attractive and pleasant without being great or bracing, but great fun and very enjoyable. Nice straightforward wine, perfect with anything light and simple, I had it with a lovely piece of Catfish and a salad – 86/100 points. £7.99 a bottle from Waitrose. Pure Merlot blended from 2 different sites on the estate and aged for 12 months in oak at Laithwaite’s beautiful Le Chai au Quai. An impressively concentrated wine with a deep garnet tinged ruby colour. The nose gives rich plums, spice, espresso and cocoa notes. The palate is fleshy with a lovely balancing freshness. Red fruit and leafy herbaceousness melds into the savoury spicy, earthy and coffee characters of oak and age. The tannins are fine, ripe and smoky. The finish is long. A very good, savoury, subtle Merlot with a real touch of finessse especially from the lovely freshness that runs all the way through the wine. A full flavoured, medium-bodied wine with a long finish, this is very good, very drinkable and great value too – 89/100 points. £9.99 a bottle from Laithewaites. This estate never fails me and this is a lovely, serious yet supple red wine. The medium bodied and full flavoured red is a blend is 50/50 Cabernet and Merlot, yet good use of oak keeps the tannins smooth. The touch of spicy oak just adds another dimension and is well integrated with the rich dark plum fruit. Excellent with all types of meals, yet fine enough to grace the dinner party table too – 88/100 points. Around £8 a bottle from Waitrose. In another life I used to sell this wine and it always pleased me as it offers superb quality and great value for money. Although very similar, I believe that Monbazillac wines are usually richer and more intense than Sauternes at a similar sort of price, so deliver lots more character. The humid conditions here seem to be perfect for botrytis or noble rot to develop which results in richly honeyed, luscious wines like this. The nose and palate are dominated by a rich orange marmalade character and barley sugar flavour while a seam of fresh acidity and a slightly bitter finish stops it from being cloying. Just delicious with all manner of things, roquefort cheese, foie-gras and especially irresistible with Panettone bread & butter pudding – 89/100 points. £9.99 a bottle from Waitrose. Personally I think that consumers are missing a trick by not drinking more Bergerac wines and by not demanding more either. The wines from this region are classic French wines and seem to be made to a high general standard, an offer some very good drinking and deliver great value for money too – what’s not to like?